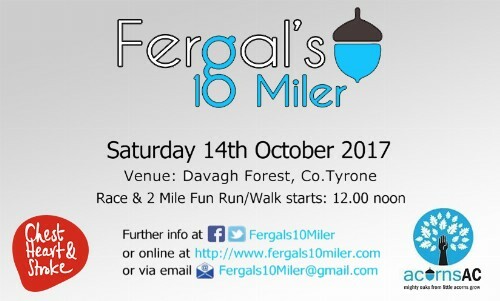 JJ Loughran would like to promote : The inaugural ‘Fergal's 10 miler’ event in memory of local Tyrone Man, Fergal Mulgrew hosted by Acorns AC running club On Saturday 14th October 2017 in Davagh Forest. Fergal Mulgrew was only 40 years old when he collapsed and died suddenly while out running with his friend in Davagh Forest, on Wednesday 12th October 2016. He was in the final stages of his preparation for the Dublin marathon and had hoped to complete the marathon in less than 3 hours. Fergal loved life, running and was also an accomplished tradesman. He completed numerous marathons, half marathons and many running events over recent years. Fergal was a long-time member of the Acorns AC running club and renowned for his helpful guidance and advice to new and less experience runners. He was known for saying ‘positivity, no negativity’, He was also a true gentleman in every sense of the word and true to Acorns AC Motto ‘Mighty Oaks from little acorns grow’, throughout Fergal’s life he proved himself to be a mighty oak. Acorns AC Running club, Fergal’s family and friends wanted to remember Fergal’s keen spirit and his love of running through Davagh Forest and therefore decided to run this event in his memory. Money will also be raised for both Northern Ireland Chest Heart & Stroke and Acorns AC Running club respectively. This will be the inaugural ‘Fergal's 10 miler’ event through the rural landscape of Davagh Forest and will provide a great challenge for runners of all abilities. There will also be a 2 mile fun run/walk on the day for people of all ages to enjoy. There will also be light refreshments after the race. There will be bespoke trophies for the first Male and Female athletes, additionally the first 300 finishers will receive a custom medal and bandana respectively , there will also be over £2000.00 in prize money for the top finishers in both Female and Male categories. The event organisers are accepting online entry, but registration will also be accepted on the day. Fun Run/Walk: £5.00 per person or £10.00 per family.